Curcumin, the yellow pigment of turmeric (Curcuma longa), the spice that is the chief ingredient in curry, has demonstrated significant anti-inflammatory activity in many experimental studies, but its clinical effects have been limited because of poor absorption in humans. Theracurmin, a special, highly bioavailable form of curcumin, represents a major breakthrough in the clinical use of this natural product. Over a dozen double-blind studies have now shown Theracurmin to produce a wide range of health benefits, including positive results on heart and liver health, muscle fatigue, skin moisture content, mood, and vascular elasticity. Now, a new study with Theracurmin conducted by researchers from the Orthopedics Division at Kyoto Medical Center in Japan, is the first double-blind study confirming the health benefits of curcumin in patients with osteoarthritis. As of October 2014, more than 5,000 scientific studies have focused on curcumin. Its primary biological effects relate to its action as a broad-spectrum antioxidant and profound anti-inflammatory agent. Its use in clinical trials has been limited due to poor oral absorption in humans. Theracurmin is the most bioavailable form of curcumin capable of increasing blood levels of curcumin, significantly greater than other forms of curcumin. It is a colloidal mixture produced by reducing the particle size of curcumin by over 100 times and emulsified with a natural vegetable gum. Detailed studies have shown that Theracurmin is not only better absorbed, but it also stays in the blood far longer than any other commercial form of curcumin. Studies have also shown it to be extremely safe with no significant side effects or drug interactions noted. 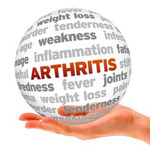 Osteoarthritis, also referred to as degenerative joint disease, is a slow destructive process of the joints that affects millions of people worldwide. It is usually treated with analgesics and nonsteroidal anti-inflammatory drugs (NSAIDs), but these drugs sometimes cause serious gastrointestinal and cardiovascular adverse events, especially with long-term use. Furthermore, there is concern that these drugs may also impair cartilage formation, thereby leading to greater joint destruction. Curcumin has been suggested as a natural approach to not only decrease joint pain, but also slow the progression of the condition. To test this hypothesis, researchers at Kyoto Medical Center enrolled 50 patients over 40 years old with knee osteoarthritis confirmed by X-ray. The patients took either Theracurmin providing 180 mg/day of curcumin or a placebo daily for 8 weeks. Blood biochemistry analyses were performed before and after 8 weeks of each intervention to evaluate safety. The patients' knee symptoms were evaluated at 0, 2, 4, 6, and 8 weeks by the knee scoring system of the Japanese Orthopedic Association and also the Japanese Knee Osteoarthritis Measure, the knee pain visual analog scale (VAS), and the need for nonsteroidal anti-inflammatory drugs. Results showed that knee pain scores were significantly lower in the Theracurmin group than in the placebo group in those patients with moderate to severe symptoms. Theracurmin also lowered the use of celecoxib (Celebrex) much more significantly than placebo. While 60 percent of the placebo group still relied on Celebrex for adequate pain relief at the 8-week mark, only 32 percent of the Theracurmin group still needed the NSAID, and there was a definite strong trend for eventual discontinuation. No major side effects were observed in the patients taking Theracurmin. These results show that Theracurmin may safely help many people with osteoarthritis improve symptoms and decrease need for NSAIDs. This study is extremely significant for several reasons. First, it shows that if a highly absorbable form of curcumin is used, meaningful clinical improvement in pain and joint function can be achieved with more significant improvements being noted in those with the greatest degree of discomfort. Second, to show such a significant advantage over a placebo in such a short-term study in osteoarthritis is very impressive. There are published studies with other forms of curcumin in arthritis, but these studies are not double-blind, placebo-controlled studies. Instead, these studies are open trials where both the physician and patient know what is being used as treatment. Open label trials in osteoarthritis are generally not considered meaningful because there is such a high placebo rate with any new treatment in osteoarthritis, e.g., about 60 to 70 percent of people in the placebo group experience significant improvement in both objective and subjective measures of joint pain and function. Double-blind, placebo-controlled studies are designed to show the true treatment effect above and beyond any placebo response. Generally, in osteoarthritis this requires a much larger study group and much longer periods of time. Therefore, for Theracurmin to show such clear benefit in this relatively small, short-term study, bodes really well for people with osteoarthritis gaining immediate and noticeable benefits out in the real world.